Sin is ugly and destructive. Appearing very appealing, the thorns of the rose sting for a long time. Mental guilt, sleepless nights, and when suppressing remembrance is exhausted, the results of the sins start to work on the health, personality, and have physical consequences. 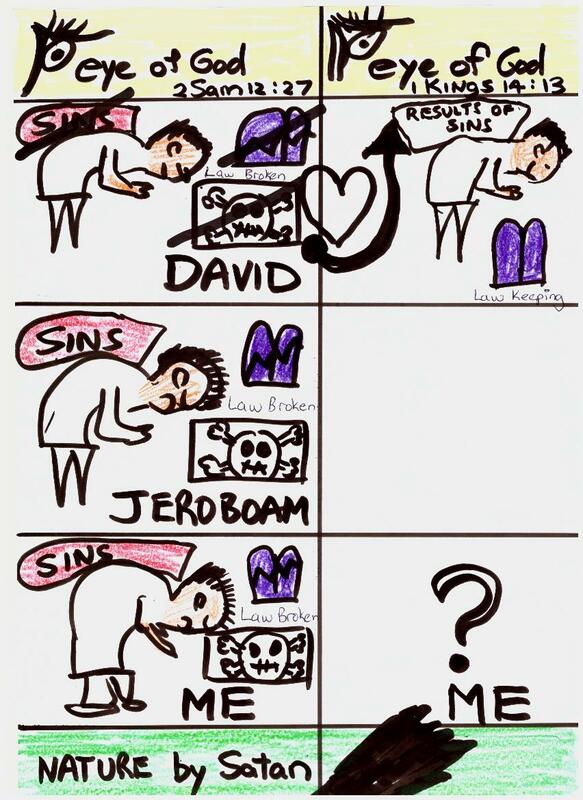 An overview of the diagram is necessary in order to look at these aspects in the life of David, Jeroboam and ourselves. Starting with ourselves: we have skeletons in the closet. We have bags of sins that we carry. We have broken the law of God which is His character and fall short of many things required from simple, ordinary human beings of whom there are many who did and do keep that law. It was not just a case of a slip-up. Those were well-calculated and well-measured decisions on our part forcefully making it happen when it does not come our way. Are we guilty? Absolutely. So people pay thousands of dollars, rands, won and yen and everything more also in euros and pounds to see psychiatrists prescribing “sleeping pills” and other pain-killers in order to “quiet the conscience”. But the conscience bothering is good, says the Bible. The Holy Spirit speaks through the conscience. So why not paying attention and find a Book called the Bible to solve our problems. 1) Slipped away from army-duty (2 Sam 11:1 “but David tarried still at Jerusalem”). Good morning. Is the reader still there? Sins have clones and they duplicate rapidly in a chain of one after the other. All in the name of secrecy and cover-up attempts. This is not just a case of “in sins my mother conceived me” or as Augustine tried to squeeze out of Psalm 51, a case of original sin which he claimed are never removed from the saint so that in the words of Martin Luther the sinner is simultaneously sinner and justified. Augustine missed the turning heart event by David. From God’s eye, these eleven sins displeased Him utterly (2 Sam 11:27 last part). David was a lost man. When Nathan the prophet came in chapter 12 and told him about the rich man and poor man with the poor man having only a pet little lamb, but the rich man took it to make food for his guest at his house, David shouted that the rich man should be killed. The law did not say kill, it said pay 400% back. David’s darkened conscience could not keep the perspective of the broken law anyway. So his punishment is in severity. All religious persecutions happen because of this same phenomenon. When Nathan said to David: “You are that man!” David realized that God knew all the time everything. He stood exposed before the grace of God. David said: “Nathan, I have sinned against the Lord”. This admission. This total commitment of his sin-bag of eleven gross crimes and mishaps were handed to the Lord. Now the answer of the Lord is a speedy 100% forgiveness: “The Lord also has put away your sin, you shall not die”. Forgiven and in the diagram the sins are crossed out (X) the guilt are paid for by Christ, the punishment of eternal death was taken by Christ and the breaking of the Law was nullified (X) as well as the closet of skeletons emptied (X). Free. But there is one thing that the Lord does not take away, and I owe it to my teacher dr. Smuts van Rooyen pointing it out in his May 1977 last sermon on this chapter at Helderberg College Church, the results of our sins. Jesus did not die for the results of our sins. What we sow we must reap. And what is required of us, is to accept God’s forgiveness of our sins, accept His gift of Christ our substitute in guilt and punishment dying the eternal death for us, and finally, Smuts pointed out, accepting Christ’s justice and Righteousness in letting us suffer the consequences of our own actions by the laws and forces of a fallen nature. It may be cancer. It may be a stroke. It may be diabetes. It may be kidney problems. Anything anywhere should be accepted by the saint as “Let Your will be done because I accept all the consequences of my actions as my own insanity”. No blame or fingerpointing to God. Years later, when Solomon was born, God gave Solomon a new name. 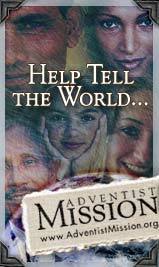 Yedidiah meaning: “Yahweh very special friend is he” (2 Sam 12:25). Finally, the confirmation of the situation of David in the eye of God is 1 Kings 14:13. Jeroboam was in the same position as David almost with breaking the law of God but whereas David made a 180 degree turn, Jeroboam did not. So God said of Jeroboam comparing him with David: “and yet, you have not been as my servant David, who kept my commandments, and who followed me with all his heart, to do only right in Mine eyes”. Also me. I need You also as my closest friend. I also need the forgiveness of David. Also I want to turn around completely and utterly to You only. All to Christ I surrender. Amen.